Home > AF Copper J-Hook Clasp 04, Antique Finish, 20.5mm NOW with Eye! 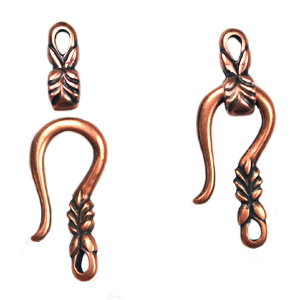 Beautiful Fancy J-Hook clasp in Antique Finish Genuine Copper. Measures approximately 20.5mm. We are now selling these with the matching Eye piece! Sold per set (1 j hook, 1 eye).